This is a hand signed 6" x 4" Black and White publicity photograph by the popular English comedy duo. 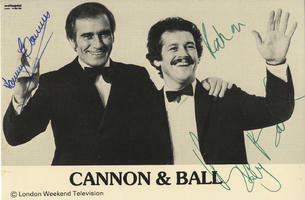 Cannon and Ball are an English comedy double act consisting of Tommy Cannon and Bobby Ball. The duo met in the early 1960s while working as welders in Oldham. They started out as singers working the pubs and clubs of Lancashire before switching to comedy after being told comics earned an extra £3 a night.